The European Union is more optimistic than the International Monetary Fund (IMF) about Greece’s economic performance because the numbers for 2016 were better than expected, Klaus Regling said in an interview with Spanish newspaper “El Pais” on Sunday, adding that there are still differences between the Fund and the EU on how to proceed with the Greek program. “There are disagreements in two areas: the IMF is more pessimistic regarding growth. We are more optimistic because we have incorporated performance in 2016, which was better than expected. Once we get all the figures from Athens, we’ll have a clearer picture of the situation. I hope we’re right because that would make it easier for Greece,” he said. The second point of disagreement with the Fund is the need for additional measures regarding debt relief to be taken now. Regling said Europeans believe more debt relief measures could be taken but only once the program is finished, if necessary, given the existing uncertainty. The head of the ESM also said Europeans are fighting hard to keep IMF on board the Greek program. “Several national parliaments approved the Greek program only on the assumption that the IMF would participate,” he noted. Asked if the 3.5 percent target for a primary surplus is too much for the country to achieve, Regling said the Greek government has said it is achievable. 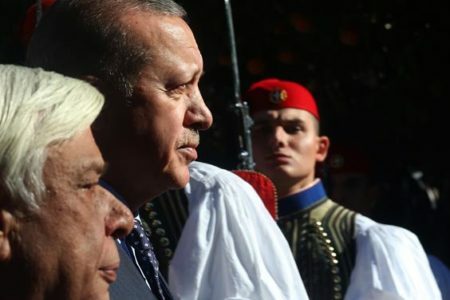 “There’s no disagreement on the level of primary surplus required – it was signed by all the leaders including Prime Minister Tsipras. According to our estimates, the measures already taken are sufficient for Greece to meet that goal in 2018,” he said, noting the question is how long the country will have to maintain it. “That topic is open to discussion, because the agreement says it has to be reached in 2018 and be kept in the medium term. There is no definition of what medium term means but we have time to agree on that,” he said.